A curious album of many musical styles, with the ultra-soulful voice of Richard Ashcroft making this one of the stand-out albums of Britpop. The album starts off with the aptly titled, 'Bitter Sweet Symphony' - a big track for The Verve, and costly, too! Whatever, it's an inventive sampling of the old Stones track, 'The Last Time'. 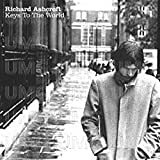 This is an album of searing intensity, with Richard Ashcroft revealing a wide vocal range - from the raucous 'The Rolling People', to the bewitchingly beautiful melancholy of the 'The Drugs Don't Work' (surely one of the greatest songs of the '90s). It's The Verve's best song, and ideally suited for Ashcroft's voice, as he wrings out every piece of emotion. 'Lucky Man' is another high quality ballad, with a superb, subtle arrangement which sweeps you up. Other eminent tracks are 'Sonnet' - a classy song, with quality guitar work and a tight rhythm; 'One Day', 'This Time', 'Velvet Morning', and 'Come On' - a loud, vertiginous, in-your-face track - ideal for anyone in a monster bad mood. Even the track I didn't like - 'Neon Wilderness' - I found myself humming subconsciously. On this album The Verve prove themselves to be a proficient band - skilful in their carrying off of so many moods and sounds - encompassing heavy rock, psychedelia, indie, folk, soul, blues (dig the wah wah! ), but ultimately having a unique sound. Never was a band more appropriately named. Richard Ashcroft can list Noel Gallagher and Chris Martin among his fans, and they have good taste. With The Verve, Ashcroft had an openly emotional quality to his voice, which was simply beautiful. His solo career has seen his reputation enhanced still further, and, at a relatively young age, he can already be considered one of the giants of British music - and he still seems a nice, unassuming bloke, too.